There will be a time in your VA career where you are faced with copy typing or transferring information from a PDF into another type of document. I recently found myself in the awkward position of having to convert files from PDF into a Power Point presentation, and it can be tricky! Of course, the obvious way to do this is to manually copy type the information from one document to another, but in my opinion as VAs, it’s our role to get the job done as quickly and efficiently as possible, and to that end, we never do things manually if there’s a piece of software to do it for us! If you search the internet, you will find there are a number of PDF converters available out there. There are some free ones available, all of which have their limitations, but can be good for one off jobs. If it’s something you need to do regularly, then it’s worth investing in a paid version, and my software of choice is Adobe Acrobat XI. This Adobe PDF convertor has a whole stack of great features, but the one in particular (that I didn’t even know it could do until recently!) 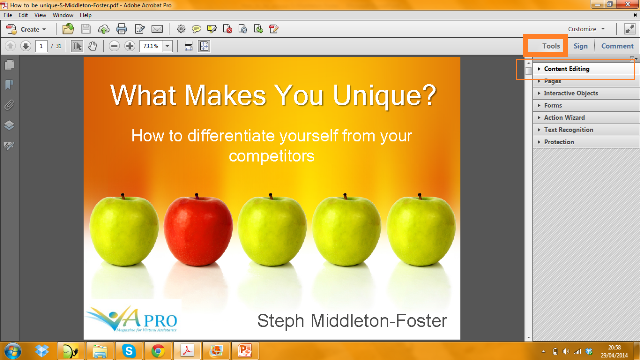 that I find useful is converting PDF slides into an editable PowerPoint presentation. 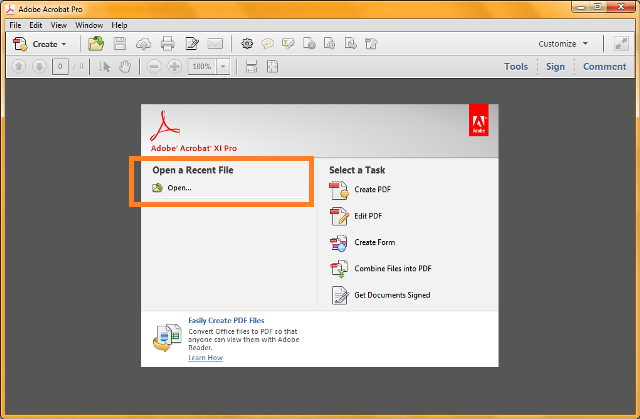 Open Adobe Acrobat XI Pro; the main window will open up. 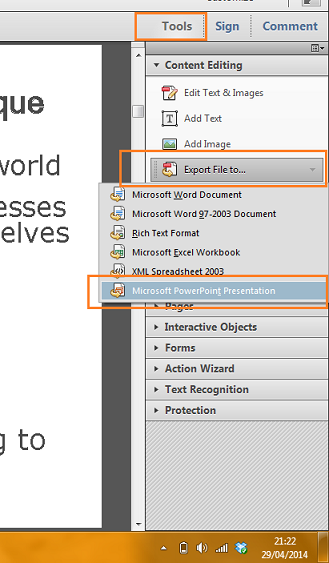 Select ‘open’ and browse to the PDF that you want to transfer back over to Power Point. On the right hand side click on the Tools tab; this opens up the side menu. Select “ Content Editing”; the Editing sub menu will expand. The “save as Dialog Box” appears. At this point you can select “Settings” and the PPTX settings box will open up. These settings control the more in-depth features of the PDF document to Power Point process of exporting. Choose “Include Comments” to ensure any comments that were detailed in the PDF document are carried into the PowerPoint document/file. Choose “Run OCR” if necessary. You can additionally change the language of the OCR settings. 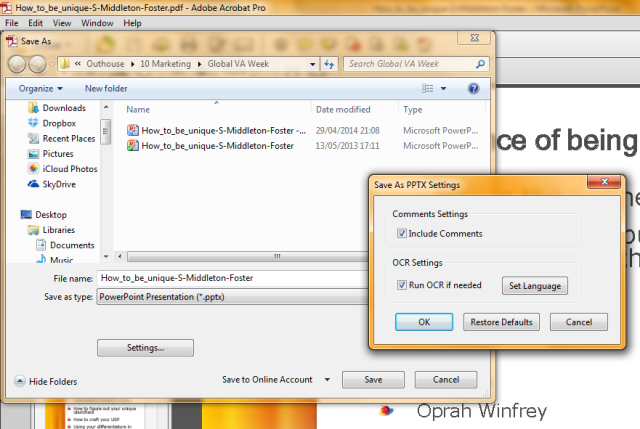 Then select the location where you would like to save your exported Power Point file and select by clicking on “Save”. Open the exported document in Power Point and it shows the file ready for editing and the PDF annotation will not appear as “speaker notes” that are editable. You have the option to delete or edit these. Look at the text and formatting of the slides that have been exported over, just to make sure that there are no problems – in particular with text and images. Select and copy any of the slides you require from the exported bundle of slides into another Power Point presentation as required. Revise and edit the full Power Point presentation if you require it all and so on – just as you would normally do with any other Power Point presentation. That is it, simple, quick and user-friendly. You are now all set to use your converted Power Point presentation!